On Saturday, seven-time NASCAR champion Jimmie Johnson raced in the Toyota Owners 400 at Richmond, finishing 12th. Less than 48 hours later, he traded his head-to-toe racing suit for a different type of racing apparel: running sneakers, shorts and a T-shirt. The 43-year-old was part of the field in the 123rd Boston Marathon — wearing bib No. 4848, of course — and posted an impressive time. Johnson is a triathlete, but this was his first time running a marathon. His stated goal was to finish in three hours, and he came quite close, with a time of 3:09:07, averaging 7:17 per mile. He was 4,183rd overall (there were over 30,000 entrants) and 646th in the men’s 40-44 age group. Lawrence Cherono out-sprinted Lelisa Desisa to win the men’s race. “That was the most challenging thing I’ve ever done, what an experience,” Johnson tweeted. “I left the pace I wanted to try to hold and came up a little bit short of my goal,” Johnson told reporters after finishing. “I wanted to race it and really run hard and challenge myself. 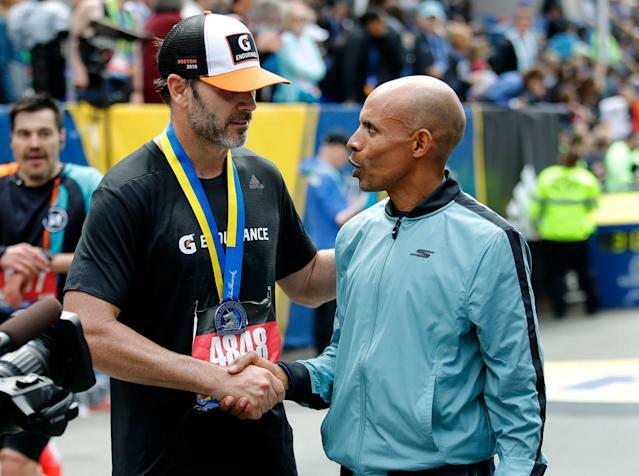 Johnson received his finisher’s medal from 2014 Boston champion and long-distance racing legend Meb Keflezighi, who served as grand marshal of this year’s race. Johnson, who was able to run through a sponsor’s exemption, was recognized by fans as he ran. “It’s been an amazing experience. I’ve learned so much about myself. I just can’t believe how the city supports all the runners on the course,” he told WBZ-TV. One of Johnson’s sponsors, Ally Racing, took over the fire station at Mile 17, in the town of Newton, handing out T-shirts and flags, and naturally Johnson got one of his biggest cheers as he passed by. Because of his time, Johnson qualified to run Boston again next year, but the NASCAR schedule probably won’t be as favorable. Two-time Daytona 500 winner Michael Waltrip completed the 2000 Boston Marathon, finishing in 4:42:20. This year’s marathon was held on the sixth anniversary of the finish-line bombing that rocked the race and the city of Boston. The tragedy touched Johnson’s Hendricks Motorsports team. Sean Collier was 26 when he was shot and killed in his vehicle by the Marathon bombing suspects during his regular night shift patrolling the Massachusetts Institute of Technology campus.